The coach and former player in Leslie Klenk understands the resistance to helmets in girls’ lacrosse. The mother in Klenk, however, has come around on helmets. Her daughter, St. Dom’s freshman Charlotte Gastonguay, has a history of concussions, and will be wearing a helmet this year in an effort to prevent further head injuries. Gastonguay and teammate Hannah Trottier-Braun are joining a small but ever-increasing number of female lacrosse players — in high school and college — who are donning helmets. The Gardiner girls’ lacrosse program is going all in: starting this season, the school is providing helmets for the entire team. In Florida, girls’ lacrosse players are required to wear helmets. U.S. Lacrosse has no such a requirement, nor does the Maine Principals’ Association. U.S. Lacrosse has approved two helmet models for girls. The Cascade LX, which features integrated eye wear, and one from Hummingbird, which must be worn with approved eye wear. The common sense equation is that helmets equal safety. But the issue isn’t necessarily that easy. Boys’ lacrosse is a full-contact sport, so all players wear helmets. The girls’ game is, proudly, different. It is more about finesse and skill than physicality. One of the concerns is that helmets will drastically alter the girls’ game by giving players a heightened sense of security that will lead them to play more aggressively and initiate contact rather than shy away from it. However, Haskell said that he didn’t notice his player playing more aggressively during preseason practices. Besides, he said, the girls’ game has already changed. It is played by stronger humans who are receiving better coaching. Haskell points out that checking isn’t allowed in women’s hockey, but those players still wear helmets. The effects of head injuries are dangerous, and that’s what inspired Trottier-Braun to start wearing a helmet in her senior season. She has suffered four concussions — three from field hockey and one from cheerleading. Klenk suggested during the preseason that Trottier-Braun consider wearing a helmet. She also has been researching concussions for a year-end presentation at school. She said that she has experienced adverse effects from concussions, believing that those she suffered have affected her vision to the point that she now wears glasses. Gastonguay’s first concussion came when she was in third grade during a parent-child soccer game. Her two others came playing basketball, one from a collision and the other this past season when a ball hit her in the head. “It doesn’t take much for me to get a concussion now,” Gastonguay said. Haskell, who has also coached lacrosse at Mt. Ararat and Thomas College, has seen too many head injuries in the sport since he started coaching in 2000. In 2012 alone, his team had five concussions. The most common body contact in girls’ lacrosse is from the sticks. Klenk said, in her experience, those hurt, but aren’t as damaging as far as concussions are concerned. More dangerous are the inadvertent collisions with other players and the ground, and the balls flying around. The helmets probably won’t eliminate concussions from girls’ lacrosse, but they will help prevent head injuries. “If you can protect the head, that’s a good thing,” Haskell said. After last season, Haskell made the decision that Gardiner was going to have headgear for every player. He and athletic director Steve Ouellette tapped into some resources and raised the rest of the more than $3,000 to purchase the 20-plus Cascade LX helmets. Haskell said the Gardiner players have been surprised by the comfort and they like the way the helmets look. They’re also happy they don’t have to wear the tight goggles anymore. 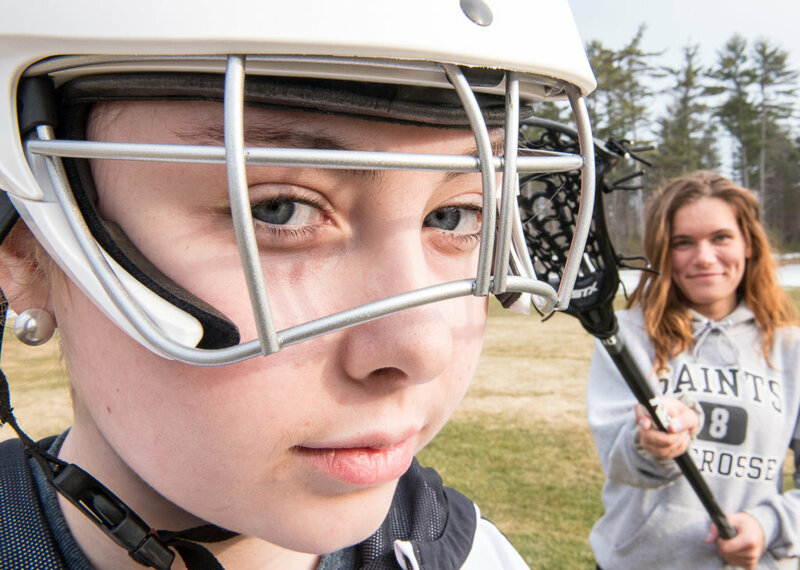 Gastonguay wasn’t thrilled, at first, about having to wear a helmet for lacrosse, but after using it she feels much more comfortable with it, and that it works even better than she realizes. Also, she said that it doesn’t affect her play. She was worried it might reduce her field of vision, but that hasn’t been the case. Helmets are still uncommon in girls’ and women’s lacrosse, but that seems to be slowly changing. Haskell and Klenk have both noticed an increasingly more college players wearing them, and think that will eventually spread throughout Maine. “I think next year you’ll see even more kids wearing one,” she added.